This handy four piece measuring spoon set by Update International belongs in every kitchen's utensil collection! 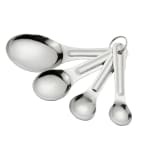 This stainless steel four piece measuring spoon set is a great set of tools for accurately measuring ingredients and mixtures. Constructed of stainless steel, this four piece measuring spoon set will resist corrosion, dents, and scratches and give you years of quality use! "Were great favors at my daughter's baby shower"
"These measuring spoons are lightweight and do the job. The price is reasonable for what they are. I would like to see a more heavy duty set."